Note: To correctly place the film inside plastic cartridges, you must slightly open the body so that there is a little space between the felt lips and then slide the film between the felt. If you do not open the body of the cartridge, there is the potential the film will not feed properly and the felt tear. Arista 35mm Plastic Reloadable Cartridges are made for excellent quality and are plastic screw-together cartridges. 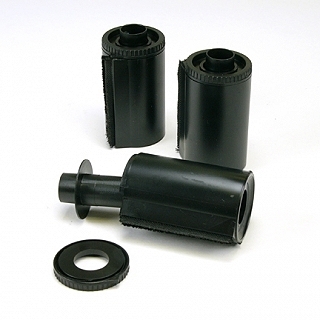 These cartridges are blank, non-DX coded cartridges and come with non-slotted spool cores.